Meniere's disease, endolymphatic sac, surgical decompression. Introduction: Surgery in the Meniere's disease is indicated when the vertigo is refractory to clinical treatment. Many surgical procedures have been proposed for the treatment of vertigo in this labyrinthopathy. In this work we aimed at the decompression of the endolymphatic sac. Objective: To analyze the postoperative outcomes of 18 patients with Meniere's disease as for the control of the vertigo and the improvement or stabilization of hearing, to compare our findings with the international literature and discuss aspects of interest regarding this surgery. Method: In this retrospective study, eighteen patients with Meniere's disease diagnosis, without improvement of the vertigo with clinical treatment, were submitted to decompression of the endolymphatic sac. In the postoperative we analyzed the vertigo control, the absence and diminishing of frequency, duration or intensity of the crises and the improvement or stabilization of hearing. Results: The vertigo control occurred in 66% of the patients, absence of vertigo in 11 (61%) and diminishing of the frequency, duration or intensity in 1 (5%). We observed an improvement of hearing in 4 patients (22.2%) and stabilization in 8 (44.5%). No patient had worsening of hearing as a result of the surgery. Conclusion: The endolymphatic sac decompression surgery is helpful for the treatment of the vertigo in the Meniere's disease and must be indicated as one of the first surgical procedures, specially in patients with light or moderate hearing loss, for the results it usually achieves and the low risk of complication. We obtained 66% of vertigo control and 22.2% of hearing improvement in the patients operated. The surgery in the Ménière's disease is indicated when the vertigo crises persist in an incapacitating manner, refractory to the clinical treatment. We persist in the medication treatment (1), by changing the medicine when the vertigo is not suppressed and leave surgery as a last resource. The objective of the surgical procedures proposed for the Ménière's disease may be: 1. To prevent the accumulation of endolymph. 2. To abolish selectively the vestibular function. 3. To destroy the inner ear totally (2). The decompression surgery of the endolymphatic sac for the control of vertigo in this labyrinthopathy was idealized by GEORGES PORTMANN (3) in 1926 and until today it is performed across the world. Our objectives are to analyze the postoperative outcomes as for the control of the vertigo and the improvement or stabilization of hearing, of 18 patients with this affection, to compare our findings with the international literature and discuss aspects of interest regarding this disease and this surgery. We performed this retrospective study with eighteen patients, eleven women and seven men aged from 32 to 68 years, submitted to decompression of the endolymphatic sac, between 1980 and 2005. All were previously clinically treated for a period of at least 18 months and the vertigo was refractory to the therapeutics instituted. After surgery, such patients were followed up in the outpatient service for a minimum period of three years. The diagnosis of the Ménière's disease was based on detailed anamnesis, otorhinolaryngological exam, tonal audiometry and vocal discrimination, imitanciometry, vestibular exam with electronistagmography or vectonystagmography and imaging exam (computed tomography of the temporal bones, magnetic nuclear resonance and polytomography in the older cases). In some cases they were submitted to electrocochleography (ECoG) and glycerol test. All patients had the diagnosis of Ménière's disease set up according to the criteria of the Hearing and Balance Committee of the American Academy of Otorhinolaryngology - Head and Neck Surgery (4). In the postoperative control the total disappearing of vertigo, decrease of frequency, intensity and duration of the crises were taken into account. For auditory evaluation the tonal thresholds in 500, 1000, 2000 and 3000 Hz of the preoperative were compared (worse tonal thresholds between audiometry exams made in the last 6 months before the surgery) with those of the postoperative (worse tonal thresholds in a period from 24 to 36 months after surgery). The vocal discrimination of preoperative was also compared to that of the postoperative. Improvement of hearing of 10 dB in the average of such thresholds or of 15% in the vocal discrimination was considered to be clinically significant. We consider the hearing worsened when there was a worsening of 10 dB in the average of these tonal thresholds or of 15% in the vocal discrimination. Under general anesthesia, a wide mastoidectomy was performed. The incus, the horizontal and posterior semi-circular canals and the sigmoid sinus were identified. The dura mater of the posterior cavity, behind the posterior semicircular canal and below the sigmoid sinus, was exposed with diamond drill. Exposure of the endolymphatic sac located before the sigmoid sinus and behind the posterior semicircular canal and below an antero-posterior axis that passes through the lateral semicircular canal up to the sinus was performed. We carried out incision of the external wall of the endolymphatic sac. The work was approved by the Ethics Committee in Research of the institution under the no. 499-09. The vertigo control occurred in 66% (12/18) of the patients: 61% (11/18) totally free from vertigo and 5% (1/18) with decrease of frequency, duration or intensity of the crises. Hearing improvement occurred in 22.2% (4/18) of the patients. Hearing stabilization in 44.5% (8/18) and worsening in 33.3% (6/18). No patient had worsening of hearing as a result of the surgery (Graphics 1 and 2). Graphic 1. Post-surgical result of the vertigo. Graphic 2. Post-surgical result of hearing. The surgical treatment of the Ménière's disease must be indicated for patients with incapacitating vertigo that does not respond to clinical treatment. The percentage of success in the clinical treatment of this labyrinthopathy are between 60% and 80%, according to the literature (5). CRUZ e CRUZ FILHO (1) obtained 61% of absence of vertigo and secondary crises in 104 patients treated clinically from this disease with follow-up between one and eleven years and a half. According to BRACKMANN and ANDERSON (6), about one in each eight patients with this affection needs surgery. The surgery procedures in the Ménière's disease may be: 1. decompressive; 2. vestibular neurectomies with access by the middle cranial fossa, retrosigmoid or retrolabyrinthic; 3. labyrinthectomy by transmeatal access or translabyrinthic. In this work we aimed at the surgery of the endolymphatic sac. Its importance in the endolymph absorption was demonstrated by KIMURA and SCHUKNECHT (7), KIMURA (8) and SCHUKNECHT and col. (9) who could provoke endolymphatic hydrops in subjects and cats by blocking of the endolymphatic duct or destruction of the endolymphatic sac. The surgery for decompression of the endolymphatic sac is aimed at increasing the blood supply and the capacity of absorption of this structure (10) or provoking its draining by the mastoid (11). Different procedures in this portion of the labyrinth achieve surprisingly comparable results - elimination or significant reduction of the vertigo in 60% to 80% of the patients, improve hearing in 10% to 30% and decrease tinnitus in 40% to 60% of the patients (12). Such surgeries differ in some details. There are the following technical variants: decompression of the sac without its opening or with wider incision or opening of the external wall (13) or with introduction of silastic lamina (14, 15, 16, 17, 18), of tube (19) or unidirectional valve (20) inside it or even with opening of the external and medial walls of the sac for introduction of endolymphatic-subarachnoid shunt (21, 22). Although all these procedures offer similar surgical outcomes, the endolymphatic subarachnoid shunt has the risk of liquoric fistula (10, 22) and meningitis (10). SAVARY and CHARISSOUX (23) carried out decompression of the endolymphatic sac in 218 patients. During sixteen months there was a total control or strong diminishment of the vertigo in 78.4% of the patients. After three years, 48.3% had vertigo totally cured and in 18.8% the vertigo had been strongly diminished. SAJJADI and PAPARELLA (15) obtained about 76% of vertigo control with the decompression of the endolymphatic sac with the introduction of silicone lamina (Silastic) inside it. Similar result to that of previous works by the same authors (16, 17). In 2% of the patients there occurred strong neurosensorial hypacusis after the surgery (15). PORTMANN (13) verified 77% of vertigo elimination in 47 patients submitted to decompression of the endolymphatic sac with wide opening of its external wall with five-year follow-up. He ascribes this higher percentage of vertigo control concerning the outcome of his prior series (65% of vertigo control) to the selection of the patients, with ECoG associated to the glycerol test that confirmed the endolymphatic hydrops and showed the reversible nature of such condition. Preservation or improvement of hearing occurred in 30% to 40% of the cases. GLASSCOCK e col. (24) compared the postoperative results of patients with refractory Ménière's disease to the clinical treatment submitted to endolymphatic subarachnoid shunt, endolymphatic mastoid shunt or to the introduction of valved tube into the sac. No significant difference was observed on the vertigo control or the hearing stabilization in the groups. The success in the vertigo resolution occurred in less than 60% of the patients, no matter the procedure used. Therefore, they abandoned such procedures in favor of vestibular neurectomy that controls the vertigo in more than 90% of the cases. FILIPO (25) compared 20 patients submitted to decompression of the endolymphatic sat to other 20 patients with the same preoperative criteria that refused the surgery. 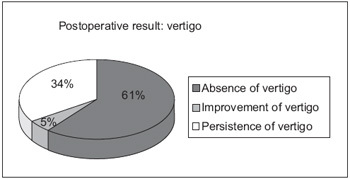 He observed an improvement of vertigo in 50% of the patients operated and in 30% of the patients not operated. We obtained a vertigo control of 66% up to three years of follow-up. Our results are similar to those of some authors (26, 27) and also to those described by PORTMANN (13) in his prior series of patients. The results of this last author (13) improved with the help of ECoG associated to the glycerol test as a means of diagnosis and prognosis. Some authors compared the decompression of the endolymphatic sac to its decompression with insertion of silastic inside it, and they did not find different results for vertigo control in the groups of patients studied (27, 28). BRACKMANN, NISSEN (21) and LUETJE (22) compared to the results of the decompression of the endolymphatic sac to those of the endolymphatic subarachnoid shunt. Similar results were found in both groups for control of the vertigo. There are works in the literature refuting the efficacy of the decompression of the endolymphatic sac. THOMSEN e col. (29) compared two groups of patients with Ménière's disease submitted to surgery. One group was submitted to the decompression of the endolymphatic sac with introduction of Silastic inside it and the other group to simple mastoidectomy. The vertigo control was the same in both groups (70%). BRETLAU and col. (30) carried out the follow-up of the patients studied in this last work mentioned for nine years and concluded that the vertigo control was maintained in 70% in both groups, which suggested the placebo effect of the said surgery. Although there were refuted on the decompression of the endolymphatic sac, we believe in the benefits of this surgery and that it must be used as one of the first surgical procedures in the treatment of this disease for the results it may offer, for its low mortality rate and low repercussion on hearing. The endolymphatic sac decompression surgery is helpful for the treatment of the vertigo in the Ménière's disease and must be indicated as one of the first surgical procedures, specially in patients with light or moderate hearing loss, for the results it usually achieves and the low risk of complications. We obtained 66% of vertigo control and 22.2% of hearing improvement in the patients operated. 1. Doctoral Degree in Otorhinolaryngology at the University of São Paulo - FMUSP. In charge of the Otology Service of the Hospital Beneficência Portuguesa de São Paulo. 2. Doctoral Degree in Medicine at the Federal University of São Paulo - EPM. Head of the Otorhinolaryngology Discipline at the Medical School of the Universidade de Santo Amaro. 3. Resident Medical Student of the 2nd Year. Resident Doctor in Otorhinolaryngology of the Hospital Beneficência Portuguesa de São Paulo. Institution: Hospital Beneficência Portuguesa de São Paulo. São Paulo / SP - Brazil. Mail Address: Nelson Álvares Cruz Filho - Rua Maestro Cardim, 770 - Bela Vista - São Paulo / SP - Brazil - Zip code: 01323-001 - Telephone: (+55 11) 3266-5105 - E-mail: nelsoncruzfilho@uol.com.br. Article received on July 29 2009. Approved on December 4 2009.